That pretty much sums it up. The game plays as good as it looks. Color coded damage numbers leapt from creatures as I unleashed fire and wind spells. The wizard has a standard attack as well as an assortment of power spells which use mana. This mana can be regenerated by holding one of the face buttons, which left me vulnerable to attack. Well, not really, since the other players were destroying everything on screen whenever I took a minute to replenish my power. That's good co-op in action. Each player's damage numbers are color coded to their character, so you know who's pulling their weight. As we played through the small level Nick pointed out a few little things like destructible environments and an AI character who accompanied us and picked up items and treasure. I was too busy raining down hellfire on the boss, a harpy who shared similar endowments to the Sorceress character. When the battle was finished we were treated to a level summary which ranked us on the treasure we discovered and the XP we earned. We were informed that there would be nine stages which would offer multiple paths for plenty of replay value. Co-op interaction would be limited by character levels and the difficulty mode, so a level 90 character can't stomp through the game of a level five character. The game will support cross save between the Vita and the PS3, but it will not support cross buy or cross play, which is disappointing. 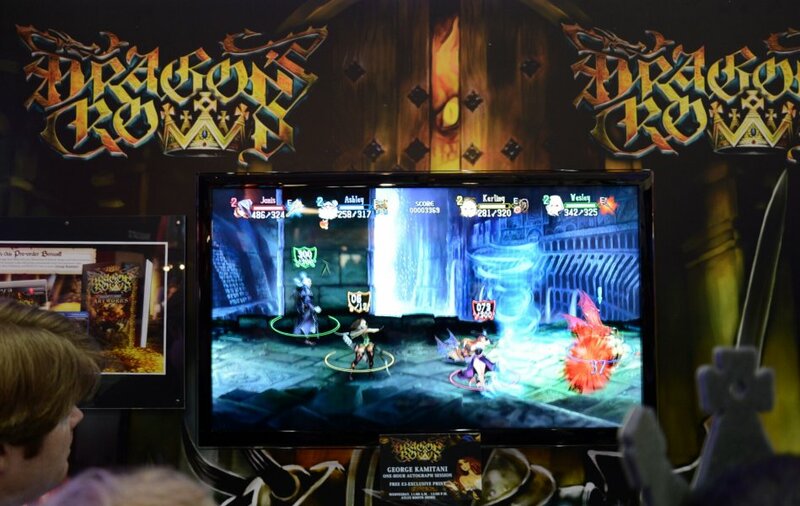 Dragon's Crown supports four player online co-op, four player local co-op, and combo co-op on the PlayStation 3. It also supports four player local co-op or online co-op on the PlayStation Vita. It will launch on August 6th. Page created in 0.2984 seconds.